Unlike the generic instant-fit amplifiers you have probably seen in TV ads, Silk 3Nx are the real deal - digital, custom programmed hearing aids with high-end features, engineered by one of the world's leading hearing technology companies. Released by Signia on April 19, 2018 the Signia Silk 3Nx falls under Signia`s standard technology level within the Silk Nx family. As standard technology, this hearing aid is the third best technology that Signia has to offer, making it a solid choice for individuals with quiet lifestyles, who primarily wish to hear better around the home, in one-on-one conversations, watching TV, and in mostly quiet and small group settings. The Signia Silk 3Nx hearing aid has 24 channels and 6 customizable programs, and that gives it the flexibility to digitally process sound in a way that sounds natural, and can also be adapted to the particular listening environment of the wearer. The Silk 3Nx is powered by a size 10 battery which will need to be changed every 3-5 days. With a maximum potential gain of 65 SPL, the Silk 3Nx is suitable for individuals with mild to severe hearing loss. With its discreet style, the Silk 3Nx sits hidden in the ear canal for a nearly invisible (and sometimes completely invisible) fit. This hearing aid is available in 2 color choices as shown below. If you have questions about the Silk 3Nx that you don`t find answered on this page, or are looking for specs on this device, you might want to check out the downloadable documents (below), visit Signia`s website, or feel free to give us a call at 800-731-6794. What makes Silk Nx different from other hearing aids? Silk Nx is the only ready-to-wear CIC (completely-in-canal) with Ultra HD e2e for superior wireless binaural processing. Thanks to flexible silicone Click Sleeves, Silk Nx offers a precise fit, right off the shelf. Is there an invisible option for people with single-sided deafness? Yes. The Silk CROS Nx is designed for people with usable hearing in one ear and little or no hearing in the other ear who want to hear sounds coming from any direction. By streaming audio from the ear with little or no hearing to the better-hearing ear on the other side, CROS Silk Nx can make it easier and more convenient to hear what’s going on all around. CROS Silk Nx functions as a remote wireless microphone for transmitting audio to a Silk Nx hearing aid worn in the better-hearing ear. Can Silk 3Nx be directly controlled by my smartphone? Yes. They are compatible with the touchControlApp for Android or Apple iOS mobile devices, so you can use your smartphone as a remote control for your hearing aids. Phone call, music and TV streaming are not supported with Silk Nx hearing aids. Yes. 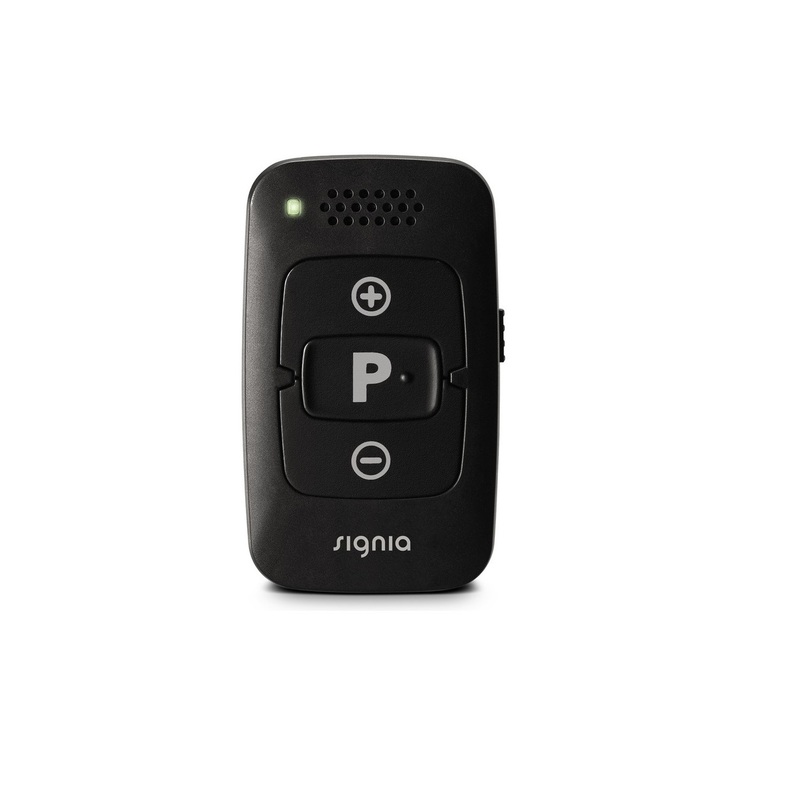 Signia’s miniPocket accessory also provides a highly convenient remote control. Invisible, off the shelf, smartphone compatible- these are just a few reasons to love the Signia Silk hearing aid. Available in a variety of technology levels and starting at just over $1000 per device through ZipHearing, we think Signia Silk is a great option for first time or experienced hearing aid wearers. The new Silk hearing aids. Our next step to invisibility. It's our mission to create the best possible solution for your hearing issue and with Silk, this solution comes in an incredibly discreet, small and powerful form. Let pictures speak louder than words, watch the video. miniPocket is the ideal solution for anyone who wants discreet, convenient control of their hearing aids without the need for a large remote control or smartphone. Reliable and easy to use, the miniPocket is small enough to carry on a key ring yet powerful enough to control all essential features. The touchControl App turns your smartphone into a discreet remote control for your hearing aids. Use it to change hearing programs and adjust the volume, bass, and treble of your hearing aids. All you need is a smartphone—no extra devices or cords. Program and volume changes: Adapt to changing listening situations by making easy and discreet adjustments. Spatial Configurator: The feature lets you steer the hearing aid microphones to focus on what you want to hear. Bass and treble: Use SoundBalance™ to effortlessly change the tone of your environment according to your listening preference. This hearing aid will come with a manufacturer's 3 year repair warranty and 3 year loss and damage warranty. As one of the few authorized Signia retailers on the web, you can rest assured that no matter what happens to your hearing aids during this time period- you're covered with a full factory warranty. At the time your order is placed with ZipHearing, you're sent a 1 year supply of hearing aid batteries delivered directly to your door. These batteries will usually arrive to your home before your scheduled date to pick up the hearing aids from your ZipHearing provider's office, but if they aren't, your provider will get you started with a few batteries at your delivery appointment. We provide premium Rayovac batteries which have a shelf life of 4 years. Simple cleaning & maintenance supplies will be provided by the manufacturer and given to you at your hearing aid fitting appointment, along with wax filters that your hearing provider will show you how to use, ensuring your hearing aids remain free of wax, oil, and other debris. VERIFIED BUYER | Fort Worth, TX	? The quality is excellent. It’s so nice to hear again. They are very small and I am finally getting to the place where I forget they are in. Learning to not hear yourself is the only strange thing but it’s only been 2 weeks. I was so surprised at how almost invisible hearing aids are now. Gone are the days where everyone knew you had hearing aids because they were so big and noticeable. VERIFIED BUYER | San Diego, CA	? Sound quality is good overall, I need to adjust the volume sometimes in crowded places, one time I had to remove them, specially in restaurants I hear lots of junk sounds like, plates, utensils, etc. They were perfect in move theater, did not miss any conversation. They are comfortable regarding the durability it is too early to comment, I have them less than a month.